Fall gardens keep the garden season going. They get us out there in the cooler weather of autumn when the heat and bugs aren't quite so bad. Just because the gardening season is winding down, it doesn't mean that we need to resign ourselves to the gray of winter yet. There are several plants that you can use to add color to your gardens that will last until the first frost and even beyond. Remember when visiting the garden center, while it might be tempting to purchase plants that are in full bloom, choosing plants for your fall gardens with tight flower buds will give you the longest period of enjoyment. Make sure that the plants have been well watered and have bright foliage. And don't forget the vegetable garden. There are many vegetables that like the cooler weather and will keep on producing until the first hard freeze and beyond with a little protection. Carrots, parsnips and other root vegetables can be kept in the garden all winter long by covering them with a good layer of mulch. Cabbage, broccoli, and others like the cooler temperatures as well. Plan for these by starting seedlings in August or late July depending on your climate. Pansies are flowers that thrive in the cooler temperatures of fall. Although considered a perennial, they are relatively short lived perennials that are most often used as annuals in spring and fall gardens. They will stand up to light frosts quite well without any protection. Asters bring their beautiful shades of purple to the canvas of our fall gardens as well as brightening roadsides adding a lovely contrast to the goldenrods. 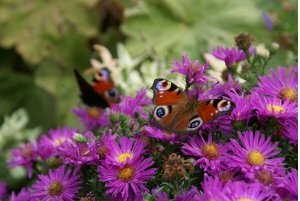 There are many different species of Asters and you will see members of the Aster family called many things. 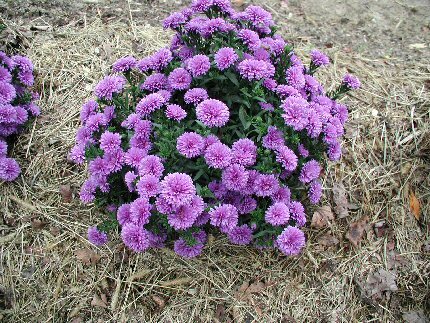 The main point to remember is that Asters are a hardy, good looking, fall blooming perennial that make a great addition to any garden. 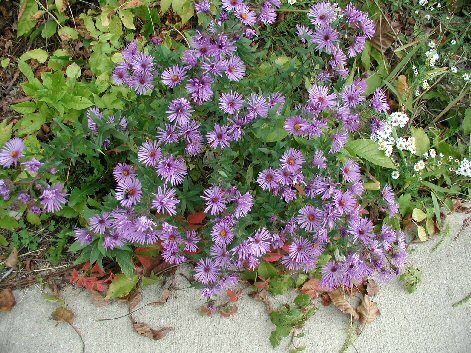 Here is a photo of some Asters that are growing wild across the road from us. They are most likely Symphyotrichum novi-belgii, or New York Aster, although plant guides do not place this species in Ohio. Maybe no one told this particular plant that, however. But who cares, they make a good looking weed. These are some Asters that we transplanted one year in early September. They are Aster novi-belgii var. Henry III. Notice the similarity in names? These flowers are different looking from the ones growing wild in that they do not have the yellow center and have a fuller, mum-like appearance although the blossoms are only 1-1/2 inches across. These Asters were semi-hardy in our area and only lasted one year. Chrysanthemums are members of the Asteracae family like the asters. They come in many different sizes and colors. 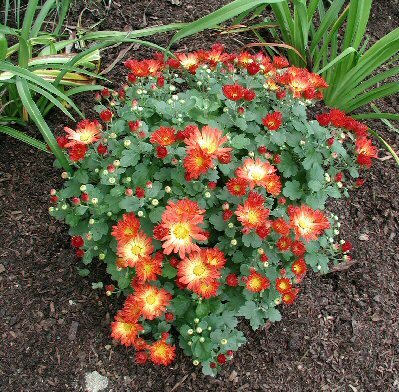 In fact, the US National Chrysanthemum Society lists thirteen distinct blossom shapes. Garden hardy mums are the most commonly available at your local garden center, but there are also exhibition varieties as well. These mums are from last year. The plants were wintered over in the garage and cut back as they grew in the summer to make them bushier. The cuttings were rooted and more plants were obtained in this manner. Starting in September, the garden centers are loaded with mums of all colors and sizes. They are usually sold as annuals in our area (USDA zone 5b) but we have had pretty good luck in wintering them over without any special care. This photo was taken in 2009 and last fall these mums were three times larger and just spectacular. Ornamental Kale or flowering cabbage is another plant that can bring color to your garden as the season winds down. The plant doesn't really "flower," it's been bred to have purple or white center leaves. Kale is very cold tolerant and frost will improve the color as well as the flavor of the plant. Yes, ornamental kale is just as edible as regular kale. Kale is very high in beta carotene, calcium, lutein and vitamins C & K. Kale can be cooked like any other green, added to stir fry or used raw in salads. Here are three different colors of ornamental Kale. Kale is very frost resistant and will look good even after several frosts. Your container gardens can also be kept good looking with a little TLC. Be sure to keep them watered and protect them from light frosts until the first hard freeze and the petunias and impatiens will keep on blooming for you. If they are portable enough, just bringing them into the garage will protect against frost.